Cell membranes: unit membrane concept,Description of fluid mosaic model; experiment to show fluidity of plasma membrane should be discussed. Functions of the plasma membrane, active and passive transport,endocytosis and exocytosis should be explained. Brief explanation of facilitated diffusion (uniport, symport and antiport) with one example. All cells are surrounded by a cell membrane (also called the plasma membrane). This is a biological membrane or biomembrane consisting of a double layer of lipids in which proteins are located. The cell membrane keeps the components of the cell isolated from the external environment. It also serves as the communications interface between the cell and its environment. Biological membranes also compartmentalize cellular functions. Inside the cell, endoplasmic reticulum, golgi, lysosomes, vesicles and vacuoles are surrounded by a single biological membrane. Mitochondria and the nucleus are surrounded by two biomembranes. The cell membrane is involved in regulating the flow of materials into and out of the cell, mediating intercellular communication and adhesion and a multitude of other functions. The structure and functions of the cell membrane have been defined by over a half a century of research using biochemical, physiological, cellular and molecular techniques. The membrane is a double layer (bilayer) of phospholipid molecules. The phospholipid tails point inwards, facing each other and forming a non-polar hydrophobic interior. The phospholipid heads face the aqueous (water-containing) medium that surrounds the membrane. Some of the phospholipid tails are saturated and some are unsaturated. The more unsaturated they are, the more fluid the membrane. This is because the unsaturated fatty acid tails are bent and therefore fit together more loosely. As temperature decreases membranes become less fluid, but some organisms which cannot regulate their own temperature, such as bacteria and yeasts, respond by increasing the proportion of unsaturated fatty acids in their membranes. Micelles: An Alternative Lipid Conformation. Micelles can form when the lipid amount is low relative to water ratio. 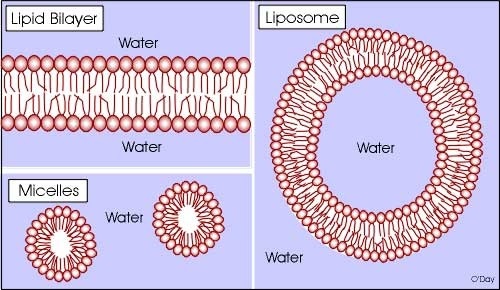 Liposome-like structures underlie such things as LDL-particles and are being used in medicine among other areas. Two types of proteins are associated with the plasma membrane, namely peripheral proteins and integral proteins. Peripheral proteins (Extrinsic proteins) : Occurs on the surface of the phospholipids bilayer. 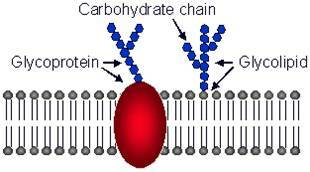 These proteins are bound to membrane by hydrophilic bonds.They can be dislodges from the membrane easily. Integral proteins (Intrinsic proteins): These proteins penetrate only the part of the way into or all the way through the phospholipids bilayer.They stay in the membrane because they have hydrophobic portions (made from hydrophobic amino acids) which ‘sit’ among the hydrophobic phospholipid tails. Hydrophilic portions (made from hydrophilic amino acids) face outwards. They can not be dislodged from the membrane easily. Glycoproteins :Carbohydrates covalently bonded to protein molecules in the cell surface membrane, forming glycoprotein. Glycolipids : Carbohydrates covalently bonded to lipid molecules in the cell surface membrane, forming glycolipids . The sugar groups are always oriented towards the external environment, never the cytoplasm. Phospholipids form the bilayer which is the basic structure of the membrane. Because their tails are non-polar, it is difficult for polar molecules, or ions, to pass through them, so they act as a barrier to most water-soluble substances. 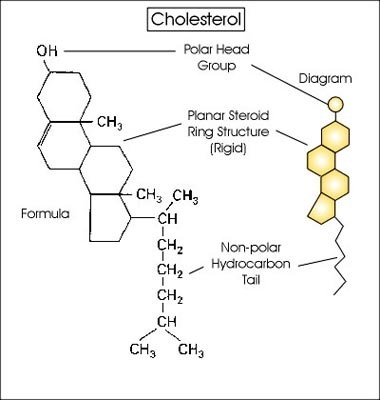 Cholesterol molecules, like phospholipids, have hydrophilic heads and hydrophobic tails, so they fit neatly between the phospholipid molecuies. They help to regulate the fluidity of the membrane, preventing it from becoming too fluid or too rigid. Cholesterol is also important for the mechanical stability of membranes, as without it membranes quicidy break and cells burst open. Proteins have a variety of functions within membranes. They form hydrogen bonds with the water molecules and so help to stabilise the membrane structure. They also act as receptor molecules, binding with particular substances such as hormones or neurotransmitters. One group of glycoproteins, known as antigens, are important in allowing cells to recognise each other. WHY FLUID MOSAIC MODEL .............? The fluid mosaic model is so called because the phospholipids molecules and some proteins can move about in the plane of the membrane, ie it is fluid.In addition, viewing from the surface of the membrane, the proteins are dotted throughout the phospholipids bilayer in a mosaic pattern. Cell membranes are asymmetric. This means the that the two halves of a membrane have markedly different lipid and protein composition. As the "fluid mosaic model" emphasizes the cell membrane is fluid. But this wasn't always appreciated by earlier scientists. Fluidity depends upon types of lipids, temperature, etc. Membranes fuse during cytokinesis (cell division after mitosis), exocytosis, phagocytosis, etc. The plasma membrane functions to isolate the inside of the cell from its environment, but it is imperative that such isolation not be complete. A large number of molecules must constantly transit between the inside and outside of the cell, most frequently one-at-a-time, but also in large packages. The plasma membrane functions as a selectively permiable membrane with exquisite selectivity regarding which molecules cross and which direction they are allowed to travel. In the simplest case, nutrients must be allowed to enter the cell and waste products to exit. Another critical task is to maintain an ionic composition inside the cell that is very different from that outside the cell. Passive transport is driven by the kinetic energy of the molecules being transported or by membrane transporters by facilitate crossing. 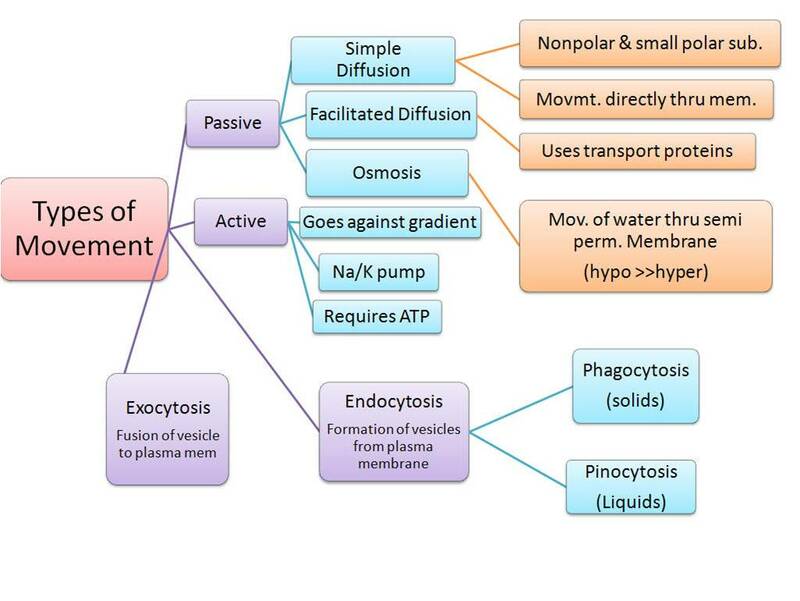 Active transport depends upon the expenditure of cellular energy in the form of ATP hydrolysis. If you open a bottle of perfume in a room, it is not long before molecules of scent spread to all parts of the room (and are detected when they fit into membrane receptors in your nose). This will happen, even in still air, by the process of diffusion. Diffusion can be defined as the net movement of molecules (or ions) from a region of their higher concentration to a region of their lower concentration. The molecules move down a concentration gradient. It happens because of the natural kinetic energy (energy of movement) possessed by molecules or ions, which makes them move about at random. As a result of diffusion, molecules tend to reach an equilibrium situation where they are evenly spread within a given volume of space. "Movement of molecules of a substance from the region of higher concentration to the region of lower concentration, due to their kinetic energy,until equilibrium is attained". The ‘steepness’ of the concentration gradient, that is the difference in the concentration of the substance on the two sides of the surface. If there are, for example, many more molecules on one side of a membrane than on the other, then at any one moment more molecules will be moving (entirely randomly) from this side than from the other. The greater the difference in concentration, then the greater the difference in the number of molecules passing in the two directions, and hence the faster the net rate of diffusion. Temperature. At high temperatures, molecules and ions have much more kinetic energy than at low temperatures. 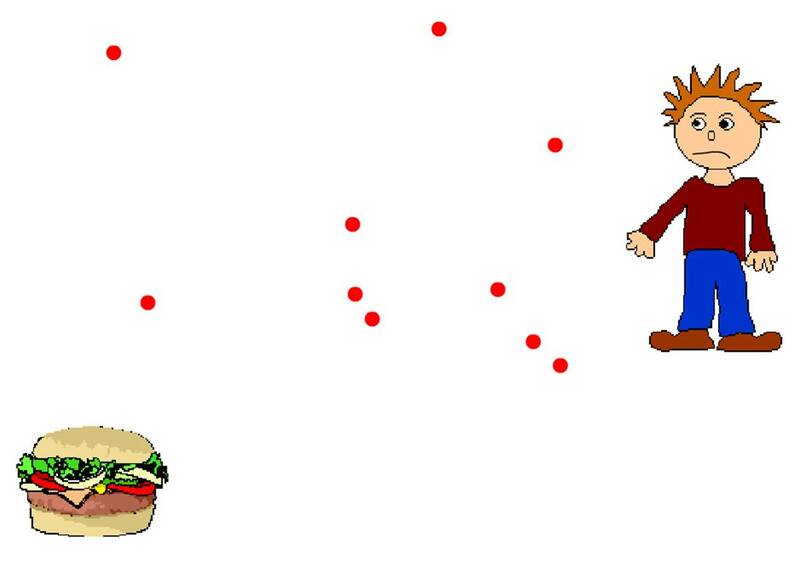 They move around faster, and thus diffusion takes place faster. The surface area across which diffusion is taking place. The greater the surface area, then the more molecules or ions can cross it at any one moment, and therefore the faster diffusion can occur. The nature of the molecules or ions. large molecules require more energy to get them moving than small ones do, so substances with large molecules tend to diffuse more slowly than ones with small molecules. Some substances have molecules or ions that are able to pass through cell membranes by diffusion. Non-polar molecules diffuse more easily through cell membranes than polar ones, as they are soluble in the non-polar phospholipid tails. The respiratory gases, oxygen and carbon dioxide, cross membranes by diffusion. They are uncharged and non-polar, and so can cross through the phospholipid bilayer directly between the phospholipid molecules. Water molecules, despite being very polar, can diffuse rapidly across the phospholipid bilayer because they too are small enough. However, large polar molecules, such as glucose and amino acids, cannot diffuse through the phospholipid bilayer. Nor can ions such as Na or C1. These can only cross the membrane by passing through hydrophilic channels created by protein molecules. Diffusion that takes place through these channels is called facilitated diffusion. Facilitate means ‘make easy’ or ‘make possible’, and this is what the protein channels do. Large polar molecules, such as glucose and amino acids, cannot diffuse through the phospholipid bilayer. Nor can ions such as Na or C1. These can only cross the membrane by passing through hydrophilic channels created by protein molecules. Diffusion that takes place through these channels is called facilitated diffusion. Plasma membranes contain many different types of protein channel, each type allowing only one kind of molecule or ion to pass through it. The movement of the molecules or ions is entirely passive, just as in ordinary diffusion, and net movement into or out of the cell will only take place down a concentration gradient from a high concentration to a low concentration. Carrier proteins are classified into three major types. 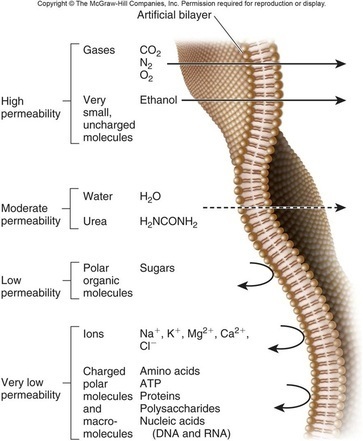 Uniporters that transport single solute from one side of the membrane to the other. 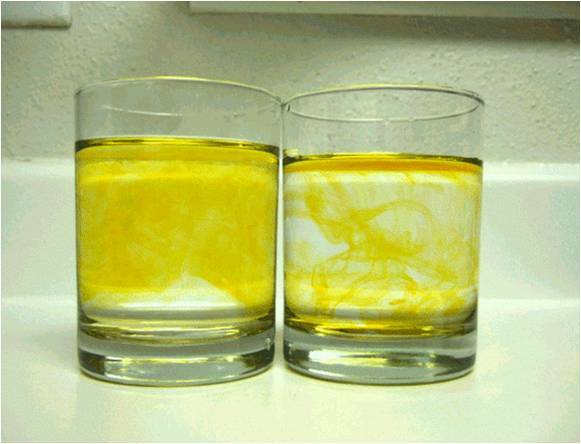 Symporters that transport two different solute molecules simultaneously in the same direction. Antiporters that transport two different solute molecules in opposite directions. Simple diffusion takes place through phospholipids bilayer while facilitated diffusion involves carrier or channel proteins. Osmosis is best regarded as a special type of diffusion involving water molecules only. When two solutions of different concentrations are separated by a selectively permeable membrane, diffusion of water or solvent molecules takes place from the solution of lower concentration to the solution of higher concentration. This process is called osmosis. Absorption of water from the soil by root hair. 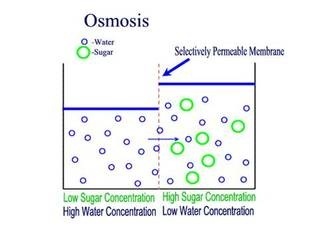 Osmosis helps in cell to cell movement of water. Mechanical support in non-woody plants. Growing tips remain turgid can penetrate into soil. Regulates opening and closing of stomata. Cells have to transport substances against the concentration gradient, i.e. from low concentrations to high concentrations. This transport called active transport is a thermodynamically unfavourable reaction. Hence, it needs energy to drive the reaction which is acquired by ATP hydrolysis. Active transport is also mediated by carrier proteins and they are called as pumps. Na+K+ ATPases that is required to maintain the potassium concentration high inside the cell and sodium concentrations low is an example for pumps. Absorption of nutrients from intestine. Absorption of Na ion and glucose from PCT. Maintains ionic and water balance. Helps in nerve impulse and muscle contraction. Particles are either too large to pass through the small pores in the membrane or too hydrophilic to diffuse through the phospholipid bilayer of the plasma membrane. These materials are transported into or out of cells by bulk transport. Bulk transport is defined as the transport of material into or out of a cell by enclosing it within a vacuole or vesicle. A vacuole is a fluid-filled, membrane-bound sac while a vesicle is a small vacuole. In bulk transport, materials are released from cells by exocytosis or taken into cells by endocytosis. Both exocytosis and endocytosis are active processes, i e they require the expenditure of energy by the cell. 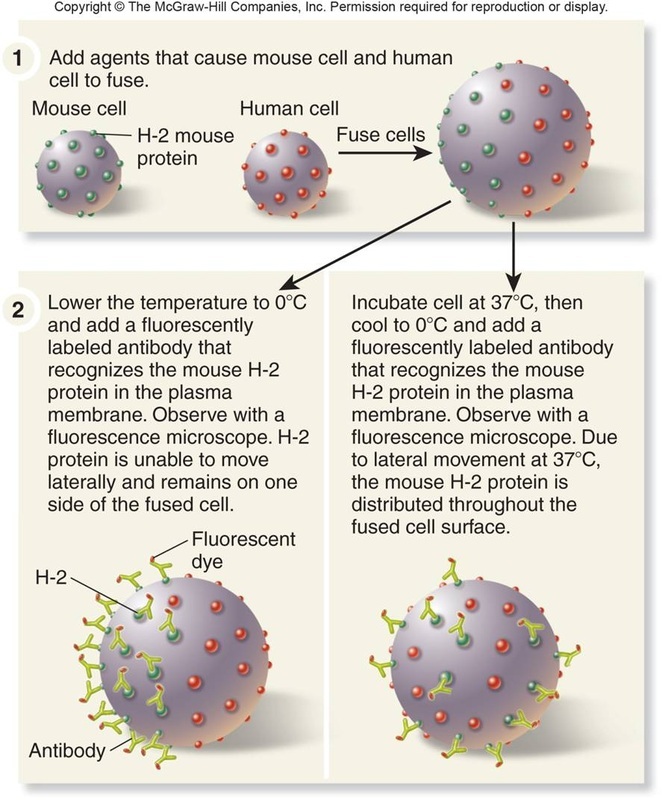 Exocytosis provides a means by which large molecules are released from cells. Examples of exocytosis include the secretion of extracellular enzymes, hormones and antibodies, and the removal of waste products of digestion. 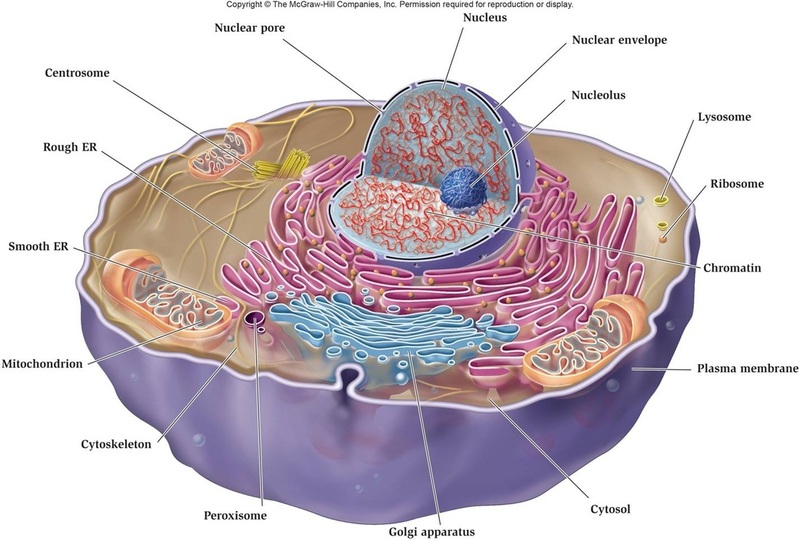 Endocytosis provides a means by which large molecules are taken into the cells. There are two types of endocytosis; phagocytosis and pinocytosis. (a) In phagocytosis (“cell eating”), a solid is taken into the cell. (b) In pinocytosis (“cell drinking”), a liquid is taken into the cell. Kupffer cells in liver engulf worn-out erythrocytes and bacteria. White blood cells (eg neutrophils and macrophages) engulf bacteria. 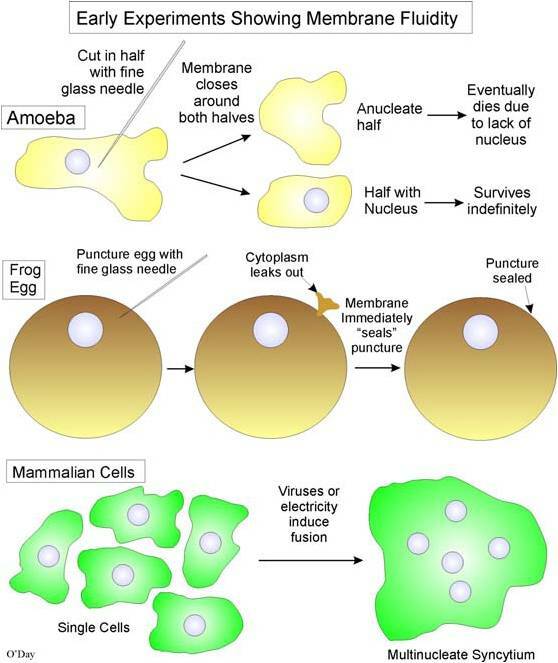 Amoeba engulfs a food particle. (b) Phagocytosis is specific; the cell discriminates between different types of particle. For example, Amoeba ingests particles of nutritional value but usually fails to take up particles that are of no food value. Another example is phagocytic white blood cells that will only enguf certain types of bacteria. Particles to be engulfed come into contact with the cell surface. 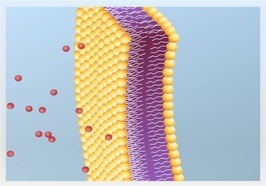 The cell membrane invaginates to form a flask-like depression around the particles.Alternatively, the cell membrane extends outwards, forming extensions (pseudopodia) around the particles. Subsequently, the neck of the flask closes and seals off the invagination, forming a separate phagocytic vesicle or vacuole. B) In pinocytosis, the cell gulps droplets of extracellular fluid in tiny vesicles. Since any solutes dissolved in the droplet are taken into the cell, pinocytosis is not selective in the substances it transports.